Free the ocean from plastic junk. 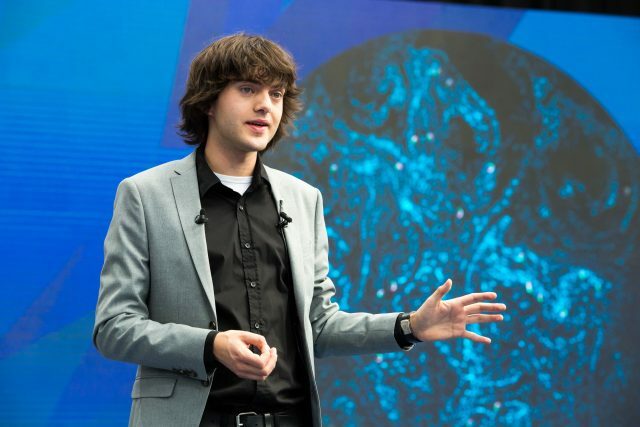 This mission of the 24-year-old Boyan Slat has now become known worldwide. 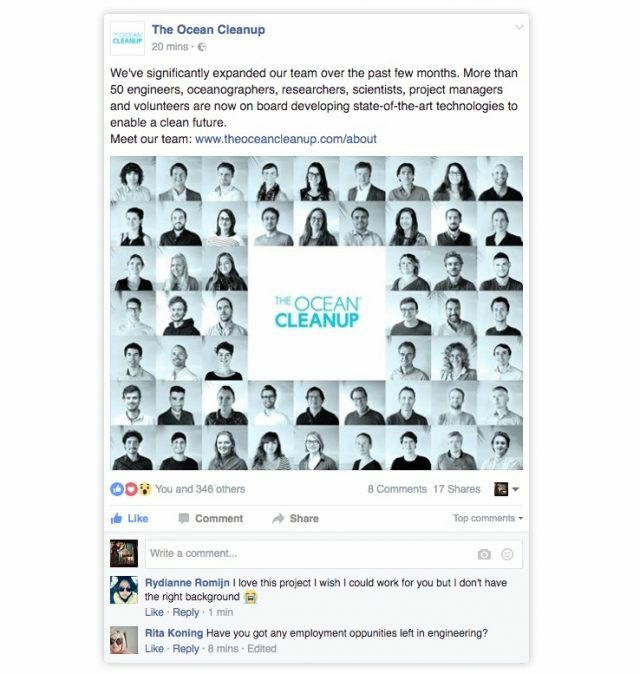 Governments, multinationals, experts and thousands of people have now supported The Ocean Cleanup. Grrr does that too; we advise on how to reduce space between the target and the end user. Furthermore we designed a their website as an attractive and accessible platform, and we are engaged in strategic plans. The goal was to let visitors move through the website more intuitively. For example, we have put all milestones on a page. This makes it easier for users to get the information they seek and be encouraged to make more use of the website. The Ocean Cleanup has been created from the idea that our current technology is capable of effectively resolving oceanic-sized problems. The organization, however, needs to grow significantly to make real impact. Donations and technicians, these are the two pillars of success that are needed now. We have set up the website in a way it is appealing to both donors and engineers, to feel committed and encouraged to join. @DannyMekic Website design i.s.m. 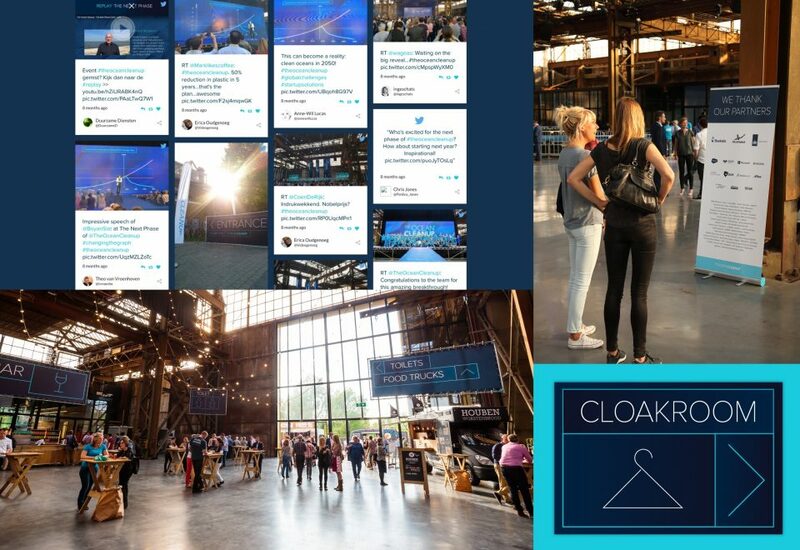 @Grrr_nl, thanks for the compliment! By 2013, The Ocean Cleanup had collected 2.2 million dollars from 38,000 people from 160 countries. The project was at that time the most successful crowdfunding campaign worldwide. 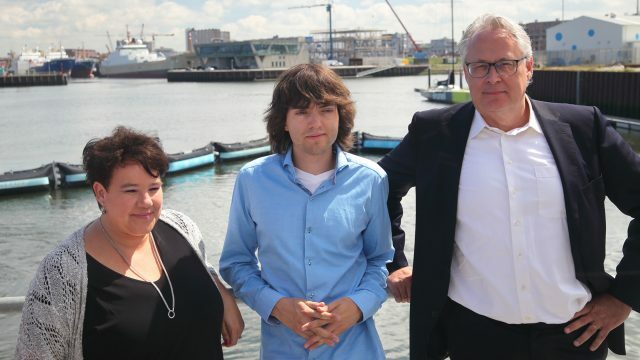 Boyan Slat’s mission is not some passing fad: experts from all over the world continue to join and also financially support him. 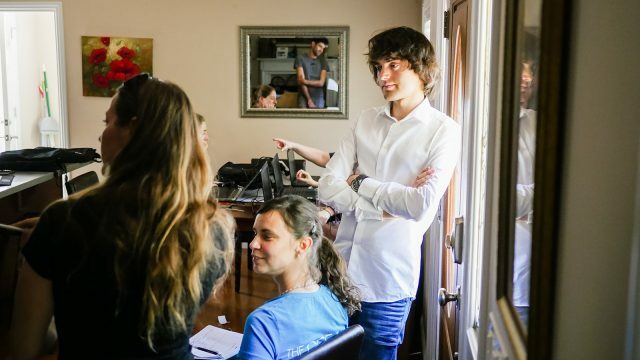 Boyan personally received a donation from PayPal founder Peter Thiel from a fund specifically intended for entrepreneurs who quit their studies to start a business. He dedicated this amount entirely to The Ocean Cleanup. 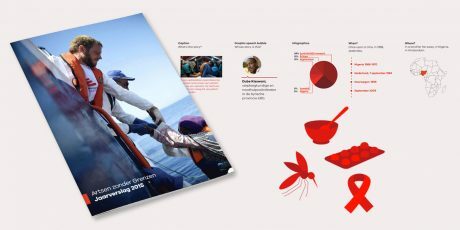 Even more important were the donations of various benefactors, including Salesforce founder and chairman Marc Benioff, a subsidy from the Dutch government and a contribution from Boskalis that made important steps in the project in 2015 and 2016. Another influential contribution was the Mega Expedition: a survey of nearly 30 ships to measure the amount of garbage that litters the sea. The Ocean Cleanup is now (beginning of 2017) working hard to realize the first operational pilot that will actually clean the ocean, which requires funding. 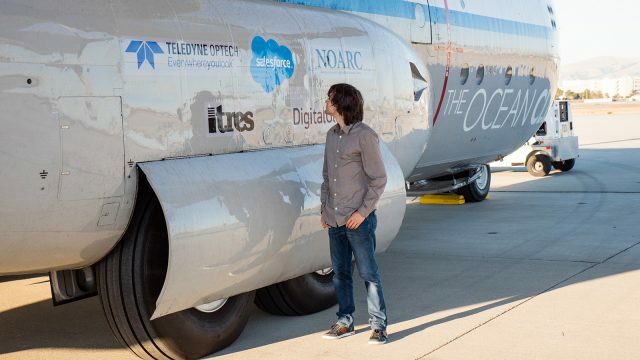 At the moment, Boyan Slat’s team works to achieve his final goal: a 100 kilometers wide setup in the ocean. 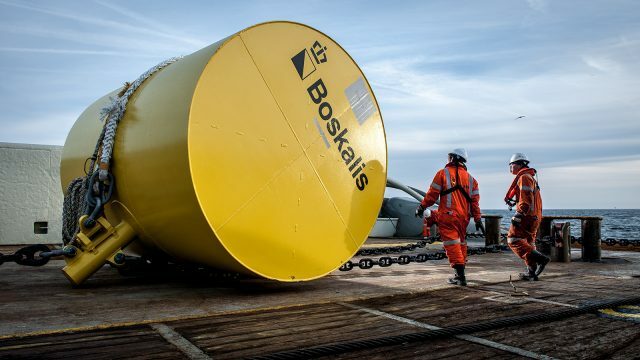 This will become one of the largest human-made objects. To meet that, many parties need to come together. You will find more information about the funding here. Of course, Boyan’s personal story is inspiring and speaks to a lot of people. To emphasize urgency, you will find a lot of information on the site, forcing the readers to face the facts: ‘Every year, 8 million tonnes of plastic waste are dumped into the ocean’. These facts are often known to experts, and we also need those experts. 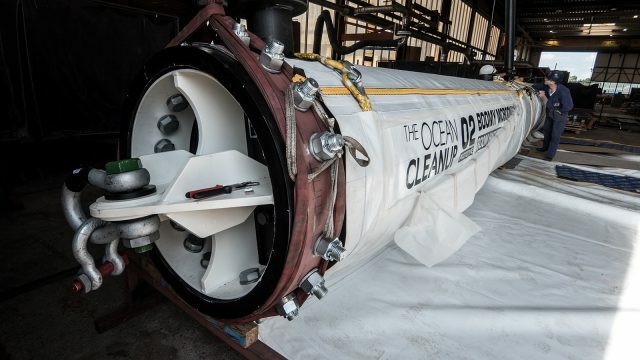 We therefore put The Ocean Cleanup down as a technical company that operates in business. Engineers, oceanographers, and other masterminds must feel involved. To achieve that, pages like “technology” and “updates” provide you with more in-depth information. On May 11th during The Next Phase event, The Ocean Cleanup finally unveiled what they have been covertly working on for the past two years; an improvement to their design that will enable them to start extracting plastic from the Great Pacific Garbage Patch within the next 12 months. 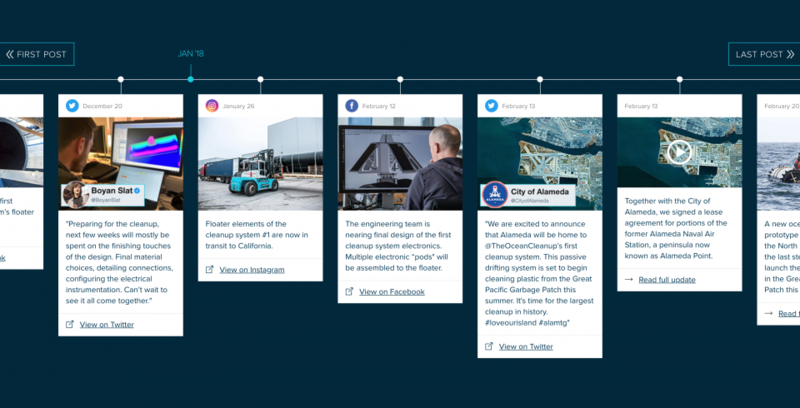 We worked with the Ocean Cleanup team on the whole communication before, during and after the event: branding, social media teaser, website, live feed, wayfinding, visualization of the new concept. The Ocean Cleanup has published (22nd of March, 2018) a scientific article about their most extensive research in the Great Pacific Garbage Patch so far. Again, the results stress the urgency of their solution: the team found between 10 and 100 kg of plastic per square mile. Because of the scientific publication, we created a new page with all the information you need about the research. A manageable version of the scientific article, to provide a more profound understanding of the results for experts. On September 8, 2018, The Ocean Cleanup launched its first system to clean up the Great Pacific Garbage Patch. 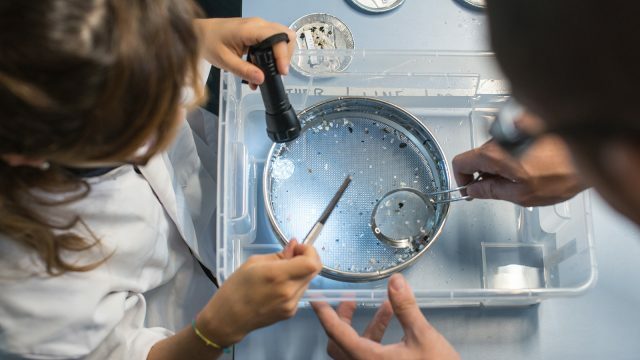 This system must prove that the hypotheses and models are correct and will be the yardstick for the further development and implementation of cleaning systems for the many plastic in the oceans. Our focus in this project aims at improving all digital and design expressions. Of course, we did not take the pictures of test balloons and test sets ourselves. 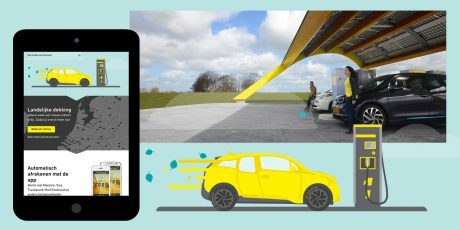 Erwin Zwart created the animations and simulations (‘artist impressions’), the TEDx video was made by TEDx Delft, the videos of the North Sea test by Boskalis and the Ministry of I&M (Infrastructure and environment). All other videos are made by The Ocean Cleanup.